ORBS IN THE STEREO!!!!! Speedy and Furball are on the case! Sniffing out pesky Orbs at a moment's notice. No, not really.... Here are 2 of the pictures we took the day my kitties decided to visit my son's apartment. He lives just down the sidewalk from my apartment. Bear, Speedy, and Furball followed me over. They came in, looked around, and generally made themselves at home while I visited with DS, his dad, and my daughter. When I got ready to go home we started looking around for the kitties. 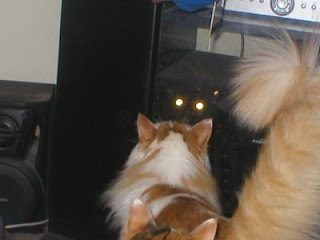 Speedy and Furball were clustered around the stereo. We were calling for Bear and heard him, but thought maybe he had crawled in to the closet in the bedroom. (They love that closet for some reason. )His meowing was muffled and sounded far away. 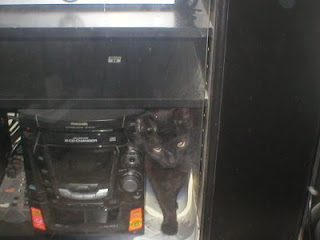 We finally looked paid attention to Speedy when he started pawing at the door of the stereo cabinet. DD grabbed the camera and took pictures. We really didn't notice the eye glow till we looked at them later. Below is the one of Bear peering out -"You can't see me- I'm - I'm hiding. Shh..."
Boy, I love my cats. Sometimes they are Too Funny. 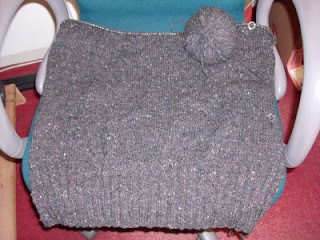 I made a LOT of progress on the back of my brother's sweater. 18 inches out of 25 inches when the neck shaping starts. I also made progress on a Baby Surprise Jacket due in October. In fact it's almost done. I'm past row 80. Hooray! I can really see it coming together. I even had an evening of help organizing and de-stashing - of course during the Olympics. Thank you, Lynne and Melissa. What a boost that was.